The popular Greek sauce is best eaten within a day of making it. 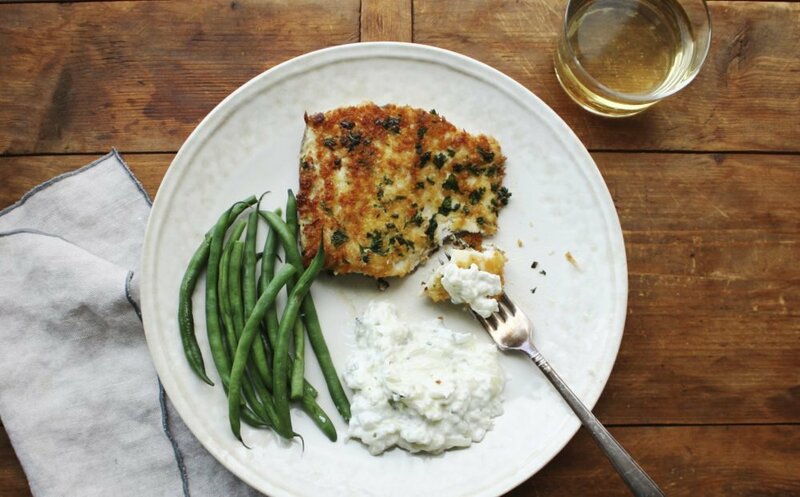 Any flaky white fish would be perfect in this recipe. You just want a mild, moist fish, which then will be encased in a crunchy coating, and a base for the flavorful, creamy and crunchy sauce. Serve this up with some steamed or sauteed green beans to round out the plate. Tzatziki is one of the most classic Greek sauces, served with everything from pita (as a dip) to lamb to seafood. It’s a refreshing mix of cucumber, garlic and yogurt, and then the options broaden. You can add any number of fresh herbs, such as dill, oregano, mint, parsley, even the fronds of fennel bulbs. You can swap out the garlic for shallots, or another member of the onion family. Olive oil is often added for a bit of richness, and there is usually some sort of acid, like lemon juice or vinegar, to give it a little kick. I added some chopped fennel to this version because I love its anise-y flavor. The amount of garlic is fairly light; add more if you wish. Different cultures have their own versions of cucumber yogurt sauce, and if you like tzatziki, it’s worth digging in deeper. And if you like tzatziki as much as I do, you may want to make extra to serve up with pita chips the next day, or perhaps dollop it on a piece of grilled chicken or a chop. Leftover roasted meat thinly sliced and piled into a pita with tzatziki makes a great makeshift gyro. Tzatziki is best eaten within a day of making it, as the mixture can start to become watery from the cucumbers. Peel the cucumber. Slice in half lengthwise, and scrape out the seeds with a teaspoon. Grate the cucumber using the large holes on a box grater, or the grating blade in a food processor. Toss the cucumber with the fennel and salt, and place in a strainer over a bowl or in the sink. Season the fish with salt and pepper. Place the egg and panko into two separate shallow bowls. Stir the parsley into the panko. Heat the oil in a large skillet over medium high heat. Dunk each fillet in the egg, so that is it well coated, then dredge each filet in the panko mixture. Place the coated fillets in the hot oil and saute the fish for about 3 to 4 minutes on each side, until cooked through and golden brown. Transfer the fish to a paper towel-lined plate. Use your hands to squeeze the cucumber mixture to press out any extra liquid, then place in a medium bowl. Add the mint, oregano, lemon juice, garlic and yogurt. Stir well, and add pepper and any additional salt as needed (remember the cucumbers and fennel were salted at the beginning). Serve the fish hot, with a spoonful of tzatziki on the side.